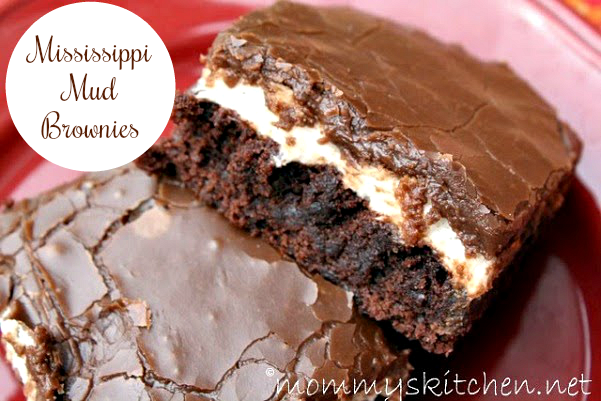 Mississippi Mud Brownies are ooey-gooey chewy brownies topped with marshmallows and a homemade chocolate fudge icing. This is the 3rd time I have made these delicious Marshmallow Frosted Brownies. I initially made them for a Superbowl party, and now I cannot stop making them. I posted about these brownies in late January, on "Blogs and Recipes Worth Mentioning". I did not go into a whole lot of details about this recipe, so I wanted to make sure this recipe didn't buried in all my posts. Today I'm making a separate post just for these wonderful brownies because they really do deserve it. They were a huge hit at the super bowl party and the whole pan was cleaned out by the end of the night. I actually had to make a second batch the following day, because my husband never did get a brownie. I love the marshmallow filling and the warm chocolaty icing on top. I think the homemade icing takes these brownies over the top. This recipe utilizes a boxed brownie mix, so it doesn't get any easier than that. If you haven't made these brownies you don't know what you're missing. Right out of the oven with warm fluffy marshmallows on top and ready for the homemade icing. Pour the icing on nice and hot, then let it cool a bit and then dig in. Make the brownie mix according to package directions for CAKE LIKE brownies. Bake according to package directions. When brownies are done, cover them with a layer of miniature marshmallows and put back into the oven for a few minutes until marshmallows are nice and puffy. Cool brownies and top with hot chocolate icing (recipe below). In a medium size sauce pan, bring 1/2 cup butter, 4 tablespoons cocoa, 3 tablespoons water, and 3 tablespoons milk to a boil. Remove from heat. While still hot, add confectioners' sugar, and vanilla. Beat well. Pour frosting over brownies while frosting is still hot. Allow to cool before cutting. These look sooo good!!!! I tried making brownies last night and was dissappointed when I cut them and they turned into mush =[ I will definitely be making these soon! these look amazing! Marshmallows and chocolate...my two favs combined! Yum! oh those looks wonderful! I will print this out and give them a try. My grandmother used to make something eerily similar, but she called it Mississippi Mud Cake. Delicious no matter what you call it! I am so happy I found your blog! I have been reading it for about 30 minutes now. I can't stop. LOL. You have some great recipes. I can't wait to try your cake mix dinner rolls. yes, this recipe is like Mississippi Mud Cake except it had chopped pecans. It is SO GOOD!! Very cool site! Keep updating!! wow! those look awesome! ill be trying them myself! Thanks (I think)for reminding me that I haven't made these yet! LOL! Yum, I soooo love marshmallow filled desserts! Btw, hope your family starts to fill better! Made this!! It was very good!! I'm so glad you are enjoying these. They are my hubby's fav next to Texas Sheet Cake. It's great to take somewhere too, people would never guess how easy they are to whip up. Thanks for this recipe. I have a ton of marshmallows left over from making the bathtub cake, so this will be great. Thanks! These brownies were awesome!! Thanks so much for your website and recipes!! This is definitely on my 'must try' list! Have you tried them with homemade marshmallows? I can't wait. This sounds like it would an excellent thing to bring to a family potluck during all the coming holidays. Once you try brownies like this you won't eat them any other way!!! I have made brownies like this for years, we call it heavenly hash brownies after the candy by Elmers candy co. They are the best!!! Sorry about the picture thing. I usually do put a comment on who took the picture if it's not my own but must have forgotten. Anyway, love your site and your recipes. So I just made this recipe and it looks delicious (still cooling!). However, I messed up b/c I didn't realize you had to completely cool the brownies w/ marshmallows BEFORE frosting. We will see how it turns out--my frosting and marshmallows are kind of a jumbled mess--not the prettiest dessert I've made but will hopefully still taste yummy! I will have to try again w/ the proper cooling instructions. Do you have a good made from scratch chewy style brownie? If so would you share it as I have been looking for a good homemade chewy style brownie for a long time. Without the frosting though, I heated nutella and poured it over the top like a thick drizzle instead. Realized afterwards it would have been great with cocoa almonds chopped over the top. But I had it over vanilla ice cream... Such a treat! These taste amazing!! I made these last weekend for my son to take to two teen youth events. For the first event, I cut the brownies into two inch squares and arranged them on a platter. Unfortunately, they did not go over well and 90% came back home. For the event the next day, with some of the same kids attending, I cut the 2 inch squares into 4 smaller pieces, placed the pieces into mini cupcake liners, and they ate every last one. My son declared them a huge hit! Thank you for sharing this deliciously decadent treat. This is a great recipe. I love making this recipe. It is easy and delicious. I made a batch and cut them into little squares for our Easter gathering. Not a single one left on the plate in fact some people had several on their plate... Just made them again today. I add walnuts to my brownies since this is a very sweet dish. I made these today. Very easy to make and very yummy and look very impressive. Just curious - is making the brownies with the "cake" texture essential to the recipe or just a personal preference? Thanks for sharing a great sounding recipe. Can't wait to try these. The birthday girl requested, so thanks for helping out! When my kids were young, I used to make these just to bribe babysitters. Worked every time!